Each week, Big Issues focuses on a newly released comic book of significance. This week, it’s an assortment of new Marvel issues with exceptional artwork by creators like Javier Pulido, Esad Ribic, Stuart Immonen, Tan Eng Huat, Luke Ross, and Carmine Di Giandomenico. 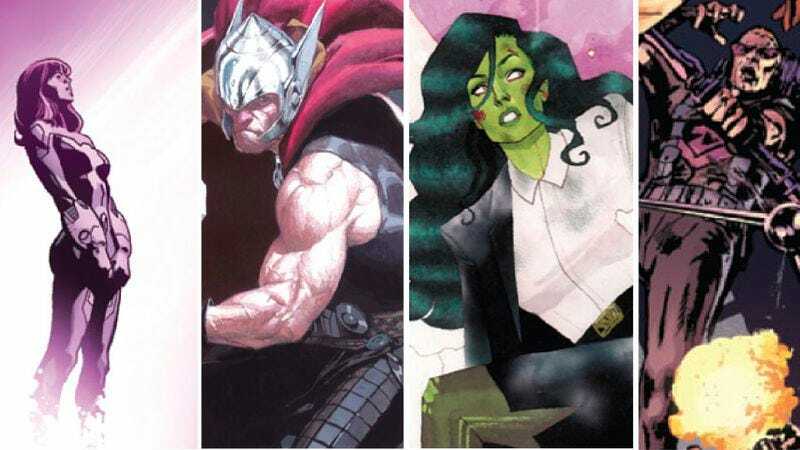 These titles show why Marvel has become a visual innovator of superhero comics, reinvigorating its line-up by embracing a wide variety of artistic talent. In the last 18 months, Marvel has become the artistic juggernaut of superhero comics. Since launching Marvel Now!, the publisher has released work by A-list creators like Michael Allred, Esad Ribic, Jerome Opeña, Stuart Immonen, and Steve McNiven among others, pairing the artists with writers who want to work with them on characters they are passionate about. All-New Marvel Now! looks to be expanding that visual range even further, bringing in a diverse groups of artists including Adrian Alphona, Tradd Moore, Mike Del Mundo, Michael Walsh, and Mahmud Asrar to offer fresh takes on both new and established characters. This week’s Marvel titles showcase the impressive stable of talent the publisher has assembled with these two publishing initiatives, providing bold, distinct perspectives on the superhero genre. Not every Marvel comic this week is a sweeping success, but there are six specific Marvel books that do phenomenal work visualizing different types of superhero stories: She-Hulk #1 is a bright legal comedy; All-New X-Factor #3 is a high-concept superhero team book; All-New X-Men #23 is cosmic sci-fi; X-Men: Legacy #24 is a mind-bending meta-comic; Thor: God Of Thunder #19.NOW is larger-than-life epic fantasy; and Secret Avengers #15 is high-octane superhero espionage action. These titles feature outstanding collaborations between pencilers, inkers, and colorists to bring the writers’ stories to life, showing just how important a confident artistic vision is in creating a strong series. Pulido’s artwork is bursting with energy from the first very page, which eliminates panel borders to give a quick recap of Jen Walters’ life when she’s She-Hulk, showing her fighting supervillains, relaxing at a bar with Thor and Tony Stark, and talking to one of her child fans on the street. It’s an invigorating start to the issue that depicts a badass, rowdy, kind-hearted lead entirely through artwork, and the excitement of that image creates a great contrast with the next panel, which presents the last piece of the She-Hulk puzzle: her career as a lawyer. There’s a big Jack Kirby influence in Pulido’s artwork, especially in the faces, which have big, exaggerated features that bring variation to a story that is primarily dialogue. She-Hulk says that 90 percent of lawyering is conversations, and all the talking heads mean Pulido’s staging skills are particularly important. A scene of She-Hulk walking down a hallway to talk to Tony Stark’s lawyer doesn’t sound very interesting, but with Pulido’s panel layouts, it becomes a wonderfully disorienting visual. Pulido is paired with colorist Muntsa Vicente on this title, and she uses a vibrant palette that gives the book a retro flair, while reflecting She-Hulk’s generally bright and cheerful worldview. Vicente has quickly become one of the most promising young coloring talents with her work on Brian K. Vaughan and Marcos Martin’s The Private Eye digital comic, embracing the fantastic setting to create an environment filled with all sorts of vivid shades. If a woman can be green, why can’t buildings be blue or pink or orange? Lee Loughridge uses a similarly bright color palette for his work on All-New X-Factor, but the application is dramatically different. Much like Loughridge’s Deadly Class, each setting is assigned a specific hue that dominates the scene, creating huge chunks of color that mingle beautifully on the page. Kris Anka’s covers similarly use a dominant shade to create a strong graphic image, and the interiors maintain that aesthetic by combining Loughridge’s palette with Carmine Di Giandomenico’s slick linework. (Peter David’s concept for the title involves a Google-like corporation forming its own superhero team, and the rainbow coloring could be interpreted as a shout-out to the rainbow coloring of Google’s logo.) Keeping with the corporate tech environment, Di Giandomenico’s designs do remarkable work incorporating fantastic superhero elements into a modern industrial aesthetic. The team’s costumes look like sponsored racing uniforms with slight variations to fit the characters’ individual personalities, and the end of the issue has Di Giandomenico showing his skill with technological detail when living machine Danger enters the story. There are similarities to be found in the art of Di Giandomenico and All-New X-Men’s Stuart Immonen, although the latter brings considerably more texture to his artwork. That extra depth is amplified by the contributions of Immonen’s long-time inker Wade Von Grawbadger, who has a keen understanding of the penciler’s linework, and colorist Marte Gracia, who uses a vivid palette that isn’t as overwhelming as Loughridge’s, but still takes advantage of the entire spectrum of colors. The current All-New X-Men storyline is a crossover with Guardians Of The Galaxy, which gives Immonen the opportunity to draw cinematic space battles and huge group scenes spotlighting his incredible character work. While the superhero action is a lot of fun, the most remarkable thing about the art in this issue is how it transitions from explosive cosmic elements to more grounded, personal storytelling. Jean Grey’s scenes evoke a sense of loneliness and despair that is a stark contrast to the surrounding events, using heavy shadows and an icy blue hue to create a much more foreboding atmosphere. While it may belong in the X-Men family of titles, X-Men: Legacy has been a dramatically different take on Marvel’s mutant team, with penciler Tan Eng Huat, inker Craig Yeung, and colorist Jose Villarrubia providing psychedelic visuals that reflect the manic, unpredictable nature of the lead character. The series comes to an end with a heartbreaking final issue that is an ingenious meta-textual exploration of fictional characters and conclusions, and the artwork reaches new levels of hallucinatory glory as David Haller finally comes to terms with his place in the universe. The imagination of the visuals in this issue is truly breathtaking, with Huat disposing of traditional rules for anatomy and environments to create highly expressive, free-flowing art that quickly morphs into something bigger, scarier, and even less controlled. Yeung has the unenviable task of inking all the tiny flourishes and overlapping textures, and he maintains the meticulous detail while Villarubia applies a neon palette that makes the linework pop on the page. Every aspect of the artwork works to build up the chaos before the issue’s astounding climax, and when the final pages reclaim a sense of order, there’s a legitimate sense of loss that the unbridled creativity of this team won’t be regularly displayed anymore. It’s fascinating to see how different artists interpret massive scope, and while Huat creates something enormous with trippy, experimental design work, Esad Ribic has a much more conventional idea of epic visuals, one that is rooted in the work of classic fantasy illustrators like Frank Frazetta. He returns to Jason Aaron’s Thor: God Of Thunder for #19.NOW, a jumping on point that sees present-day Thor returning to Earth while his future self encounters a hungry Galactus. Everything in this book is big; it begins with an establishing shot of a galaxy, and includes multiple striking splash pages that constantly emphasize size. A two-page image shows two gigantic submarines that are later destroyed in a magnificent splash page revealing Thor’s full might, and a later splash is a museum-quality piece depicting Thor as he flies his hammer into a frost giant’s face. Ive Svorcina’s digital coloring takes a painter-like approach that further stresses that classic illustration quality, taking on added responsibility in regards to shading and creating textures so that Ribic can turn out artwork faster. It’s a stunning issue, and as an added bonus, it includes a code for a free digital copy of the first Thor: God Of Thunder collection, meaning new readers can be exposed to even more Ribic and Svorcina goodness. Huge scope works for a book like Jason Aaron’s Thor, but for the more suspenseful, grounded Secret Avengers, smaller is better. Luke Ross takes over art duties from Jackson “Butch” Guice for this penultimate issue before the book’s relaunch next month, and the artist does the best work of his career by experimenting with graphic page design. It’s very likely that much of the art choices are dictated by Ales Kot’s script (working from a plot by Nick Spencer), as Kot’s Image series Zero takes a similarly stylized approach to the espionage action narrative. The influence of super-spy luminary Jim Steranko is strong in this final arc, and like Steranko’s artwork, Ross’ layouts take into account the impact of the page as a whole in addition to the value of individual panels. Colorist Matthew Wilson is essential in this regard, using a dramatic palette that takes advantage of the clash between warm and cold colors to create a constant tension throughout the issue. An early two-page spread shows Nick Fury Jr. and Black Widow charging through a group of A.I.M. henchmen, and the main image is letterboxed between two rows of smaller panels along the top and bottom of the page showing individual actions with bright blue and red representing Fury and Widow, respectively. As events become more frenzied, the number of smaller panels increases, slowing down these quick fight scenes by breaking them into separate moments. (A highlight is when Fury shoots two bullets at an A.I.M. goon and two small panels show X-rays of the bullets entering the man’s thigh and skull.) This adds amazing visual variation to the pages, and also makes each hit more impactful. In an especially clever touch, panels of M.O.D.O.K. signing a binding agreement placing him in the employ of S.H.I.E.L.D. are folded into the final action sequence, suggesting that this hiring decision is just as dangerous as facing down a flurry of bullets. These six titles all have their own distinct flavor thanks to the diversity of Marvel’s artistic talent, and while the double shipping schedule of many of these books means that rotating art teams are required to give creators extra time, it’s also helped bring in an even wider variety of talent. The debate over the importance of writers versus artists is one that is constantly revived in the comic-book community, but it’s hard to imagine Marvel having the same kind of success with its two recent publishing initiatives without the exemplary work of its current lineup of pencilers, inkers, and colorists.